When operators pull oil out of the ground, it often comes up with copious amounts of natural gas. This “associated gas” can be captured and brought to market, creating an additional revenue source for operators. But if no gathering infrastructure or other methods of capture are deployed, operators either vent the gas to the atmosphere or burn it off with controlled flares. Venting results in the release of methane, a powerful greenhouse gas. 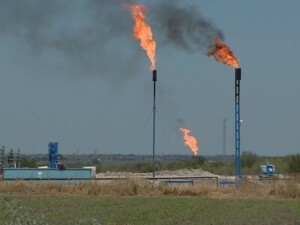 Flaring results in troublesome emissions as well, including CO2 and hazardous air pollutants. According to the Wyoming Oil and gas Conservation Commission (WOGCC), Wyoming’s oil and gas operators vented and flared more than five billion cubic feet of natural gas in 2014. Five billion cubic feet of gas that could be sold to generate taxes and royalties, heat homes and power machinery across the country, instead was wasted. This waste is due, in part, to lax rules in Wyoming that allow more than 90 percent of wells to vent and flare significant amounts of gas without having to apply for a permit or demonstrate an economic justification to regulators. It makes sense, therefore, that the WOGCC would want to address this wasteful practice by placing meaningful limits on the discretion of operators to flare and vent natural gas in the Cowboy State. Unfortunately, a new draft rule proposed by WOGCC last week falls well short of the “meaningful” benchmark. It is important to note that in some circumstances flaring, and, to some extent, venting, are necessary in order to operate oil and gas facilities safely. However, both practices waste an important domestic energy resource and result in air and climate pollution. Therefore, venting and flaring should be limited to the extraordinary circumstances in which safety dictates the burning off or releasing of produced gas or in which no alternatives are economically feasible. Under the proposal announced by WOGCC last Tuesday, operators flaring up to 60,000 cubic feet of natural gas per day (94 percent of the wells in Wyoming reporting flared or vented gas) need not even apply for a permit to do so. And operators venting up to 30,000 cubic feet of gas per day likewise need not seek permission. The proposal imposes no time limits on venting and flaring at these rates and it does not require operators to demonstrate economic necessity in order to get a permit for flaring above the thresholds. While there are some good measures in the state’s proposal, such as requiring operators to submit gas capture plans with their applications to vent or flare, it is simply not strong enough to address the magnitude of the problem of venting and flaring in Wyoming and belies the state’s reputation as a leader on smart, sensible regulation of the oil and gas sector. Other states have done a better job on the issue of flaring. In North Dakota for instance, state regulations flatly prohibit the venting of natural gas and require operators to meet the state’s gas capture goals or face oil production curtailment. A prohibition on venting except in certain narrowly defined emergency circumstances. A requirement that all flaring may be conducted only pursuant to a permit and that such permits should only be good for a finite amount of time to ensure that flaring is a temporary process, not a permeant source of waste. A requirement that best flaring technologies are used (such as auto-ignitors and a 98 percent destructive rate efficiency requirement) to minimize waste and protect air quality. Gas capture planning requirements that include an economic analysis to examine if flaring is necessary and if so, for how long. Improve record keeping and reporting requirements to ensure vented and flared volumes are reported separately. As Wyoming leaders look at a tough budget picture, sensible efforts to curtail flaring and end venting, while also quickly finding and fixing leaks at oil and gas production sites statewide are smart measures that can both recover more revenue from the state’s oil and gas resources as well as keep the air clean. North Dakota Steps Up to Curtail Wasteful Flaring, But Will it be Enough? This entry was posted in Air Quality, Natural Gas, Wyoming and tagged Flaring, regulations. Bookmark the permalink. Both comments and trackbacks are currently closed.